Prof. Krikor Azaryan received the title “Honorary Citizen of Plovdiv”, awarded to him on the occasion of his 70th birthday anniversary, 2004. Prof. Azaryan is receiving the honorable title due to his great input to Plovdiv’s culture and theatre life. 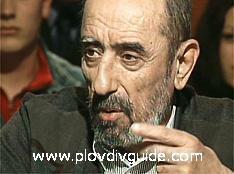 Krikor Stepan Аzaryan – theatrical director, born March 15th, 1934, in Plovdiv. He defines himself as Bulgarian as citizenship, Armenian as nationality. Theatre director, Professor. Artistic manager of a class in Acting & Staging, at the National Theatre and Filming Art Academy in Sofia.Theatre director at the Bulgarian Army Theatre. His career: After graduating from the “Staging” class of Prof. Sasho Stoyanov at the “National Theatre and Filming Art Academy” in Sofia in 1966, he later specialized “Theatre Staging” under Anatolij Efross and Georgij Tovstonogov in Moscow and St.Petersburgh, in 1969. His debut was the performance “The diary of a Mad Man” (1966), based on the Gogol’s play, on the stage of the “Theatre 199” in Sofia. 1990 -present, the Bulgarian Army Theatre in Sofia. He has staged a lot of performances in various other theatres (e.g. The Pazardzhik Theatre, 1965-1975) throughout Bulgaria, Poland, former Yugoslavia, and in the recent years – Macedonia and Russia. He started his teaching career in 1970, as an assistant professor of Prof. Zhelcho Mandadzhiev, at the “National Theatre and Filming Art Academy” in Sofia. Since 1976 he has taught to classes in Acting & Staging. He became a Professor in 1988. He has directed one film and many TV theatre performances. Prof. Azaryan has been awarded various national theatrical awards.